Address: GENCO Holding Company Limited (GHCL), 1st Floor, OPF Building, Shahra-e-Jamhuriat, Sector G 5/2, Islamabad. 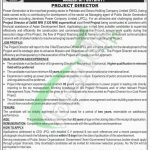 Get GENCO Holding Company Jobs 2018 Project Director Eligibility Criteria from the page. The GENCO Holding Company Limited is the public sector organization which is responsible for the better corporate management and operations of the GHCL is currently looking forward to hiring the most diligent, well energetic, proficient and caliber applicants who bear the nationality of Pakistan are welcome with the open arms to apply against the post of Project Director. The vacant post is for 2x660 MW (1320 MW) supercritical coal-fired Project and the appointment will be on contract basis for a period of two years and it can be permanent or extendable on satisfactory performance of an individual. Candidates wanted to apply should possess Bachelors of Engineering (Electrical/Mechanical/Electronics) from HEC recognized University with 15 years relevant expertise in the field is required. Age limit should be 62 years. The excellent remuneration package will be handed over to the applicants and family conveyance and officers with medical accommodation and medical facilities will be provided. So, let's have a look now it's applying criteria. Interested applicants need to drop their CV with the two work references with two passport size photographs should reach at the given address before the due date. The last date for submission of application is November 26, 2018. Applications received after the due date and incomplete one will not be entertained. So guys, now if you really a job seeker so apply as soon as possible and be the part of this page forever to get wonderful and exciting job news. So, stay in connection with this page for more jobs and get all sector jobs with a blink of an eye with all applying facilities. Last Date For Apply: November 26, 2018.